President Donald Trump leaves the podium after speaking about the partial government shutdown, immigration and border security in the Diplomatic Reception Room of the White House in Washington, Jan. 19, 2019. "Without a Wall our Country can never have Border or National Security," Trump tweeted Tuesday. 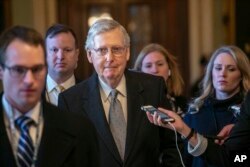 At the Capitol, Senate Majority Leader Mitch McConnell, a Kentucky Republican, promised votes Thursday on Trump's proposals, contained in a 1,200-page bill unveiled by Republicans. Senate Majority Leader Mitch McConnell, R-Ky., leaves the chamber after speaking about his plan to move a 1,300-page spending measure, which includes $5.7 billion to fund President Donald Trump's proposed wall along the U.S.-Mexico border, Jan. 22, 2019. 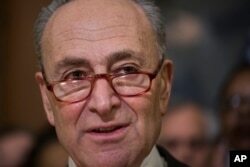 "The president's proposal is one-sided, harshly partisan, and was made in bad faith," said Senate Minority Leader Chuck Schumer, a New York Democrat. "Now offering some temporary protections back in exchange for the wall is not a compromise, it's more hostage-taking … like bargaining for stolen goods." Even if the White House package cleared the Senate, it would be dead on arrival at the Democratic-led House of Representatives, said Speaker Nancy Pelosi of California, who called it "a nonstarter" and promised House votes on border security bills that do not include wall funding. 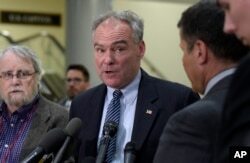 "I do believe it is a proposal that deserves to be treated seriously," Virginia Sen. Tim Kaine said, adding that the bill should go through committee and be subject to amendments by senators of both parties in order to attract bipartisan support. In this Oct. 9, 2018 photo, police office guards the main entrance to the Supreme Court in Washington. Meanwhile, the U.S. Supreme Court dealt the Trump administration a setback. 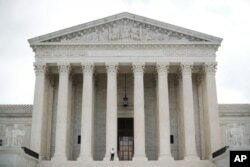 The court ruled it would not immediately act on an administration request to end the Deferred Action for Childhood Arrivals program started by former President Barack Obama that protects nearly 700,000 so-called "Dreamers" from deportation. The Senate Republican proposal includes $5.7 billion for Trump's wall, a favorite pledge of his during his successful 2016 run for the White House, although he has abandoned his claim that Mexico would pay directly for it and now is seeking U.S. taxpayer funding. 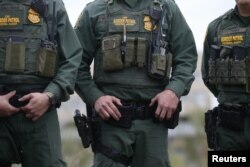 He says the border barrier is needed to stop illegal immigration and drug trafficking. U.S. Customs and Border Patrol agents watch as President Donald Trump visits the banks of the Rio Grande River in Mission, Texas, Jan. 10, 2019. The Democrat-controlled House of Representatives has passed several bills aimed at reopening the government, but McConnell has refused to put them up for a vote in the chamber because Trump does not support them. House Democrats are promising to vote for more border security measures this week, but none that includes money for Trump's wall.